Sadly, Brendan passed away on the 18th of February 2016. 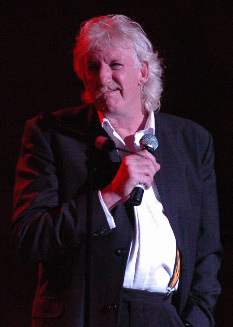 Brendan Healy began as a musician playing keyboards in groups around his native North East. Most famously with the legendary rock band 'Lindisfarne'. He then moved into theatre and was immediately snapped up by Andrea Wonfor, then of Tyne Tees Television, to present children's television. Most notably 'Razzmatazz' in the seventies. Brendan still works in television and has written over forty signature tunes to date. He still plays keyboards with John Miles and writes with Brian Johnson of 'AC/DC'. He returned to theatre and spent many years either in rep, or touring alongside such stars as Penelope Keith, Toyah Willcox, Bill Maynard and Russ Abbot. Brendan has played everything from Shakespeare to comedy. He also played 'Bernard' in the West End production of Strippers. He played 'Tol Briston' in the Emmy award winning 'Black Velvet Gown' and appeared in 'The Girl' and 'Dinner of Herbs', all Catherine Cookson films. He was 'Eric' in 'Spender', appeared in 'Boon', 'Auf Weidersehen Pet', 'Crocodile Shoes' and 'Coronation Street'. Brendan played the part of 'Ray' in the series 'Badger' with Jerome Flynn. He now has his own production company M.H.M. Entertainments producing pantomime and musical theatre. Brendan has spent the last fifteen years as a comedian and has appeared on television in various shows. He is also in huge demand on the after dinner circuit where he has become one of the most sought after comedy speakers available.